The Russian coach who mentored Olympic silver medallist Vijay Kumar will assume the role in October, right after a six year long successful tenure as a coach with the Indian Army. In a sign of growing sporting ties between the two countries, the National Rifle Association of India (NRAI) appointed Russia’s Pavel Smirnov is the new national pistol shooting coach of India. Smirnov has earned a lot of appreciation in the country’s shooting fraternity for mentoring Olympic silver medallist and armyman Vijay Kumar. Kumar won the medal in London last year in the 25m Rapid Fire Pistol event and generously shared the credit with his coach. “We found him to be someone who has the potential to train our shooters for medal winning performances. His role in Vijay Kumar’s success has proved it,” the secretary of NRAI, Rajeev Bhatia says about Smirnov. 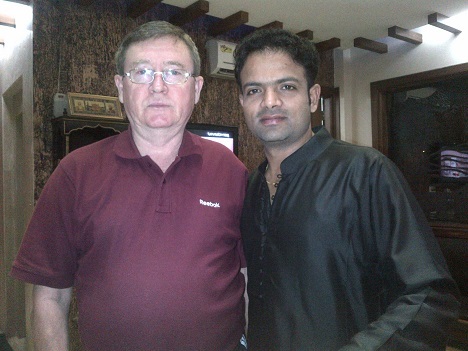 Till now Smirnov had been working with the Army Marksmanship Unit (AMU) in Mhow, Madhya Pradesh. Previously he was employed as a coach with the junior shooting team of DOSAAF Russia. The Indian Army employed him in 2007 to further their ‘Olympic Mission’ program. At AMU, which is a specialised unit of the Infantry School, he joined the project to identify talented shooters within the army and train them for national and international competitions. Over here, his five year long association with Vijay Kumar resulted in a number of Asian and Commonwealth Games medals and ultimately, the much coveted Olympic glory. Kumar describes their coach-sportsperson relationship as very effective, “He guides me in a very systematic manner. His observations have always helped me. More importantly he lets me decide which advice to follow,” Kumar points out that Smirnov never imposes himself on his students. “In shooting it is critical to stay calm. Many time just talking to the coach helps in dealing with the pressure,” Kumar says. “Once I had qualified for the Olympics, I requested the authorities to allow Smirnov to travel with me. We trained very hard before the tournament,” Kumar recalls. “As the national coach he will be able to spend more time with the team and will also travel with us for all tournaments,” Kumar believes that his coach will be more effective in his new role. Smirnov’s successful term with the AMU is now over and he is bidding farewell to the cantonment town of Mhow. “I am going to Moscow for a month before I join as the national coach in October,” he says. Kumar and some of his fellow officers organized a party for him, “I think it is wonderful that he has been chosen for the national role just as his term with the Army ends. We all got together for a farewell dinner. We had a cordial time with some nice conversations and he was very happy,” Kumar says. The Indian national team had been without a dedicated pistol coach since 2008. The high-profile Ukrainian coach Anatoly Podubbny was brought on board for the previous Olympics but his term was marred with disputes with the Sports Authority of India over financial matters. Of the four London bound pistol shooters, Kumar trained with Smirnov, Heena Sidhu and Annu Raj Singh trained with the overall national coach Sunny Thomas, while only Rahi Sarnobat worked with Podubbny that too at a private academy in Pune. Kumar, Thomas, and the ace former shooter, Jaspal Rana, have many a times lauded Smirnov for his positive influence on the army marksmen. Finally, he has been signed up to fill a significant void in the national pistol team. Bhatia confirms that Smirnov has been assigned the tenure till the 2016 Olympics. This development is just in time for the major tournaments next year the World Championships, Commonwealth Games and Asian Games. With the quota places for the next Olympics opening up soon, Smirnov has his task cut out for him.